Sailing through the Mediterranean, it’s easy to get distracted by the pristine, calm waters – the bluest I’ve ever seen. But the same waters that draw international tourism are also the becoming the site of the largest mass migration in modern times. 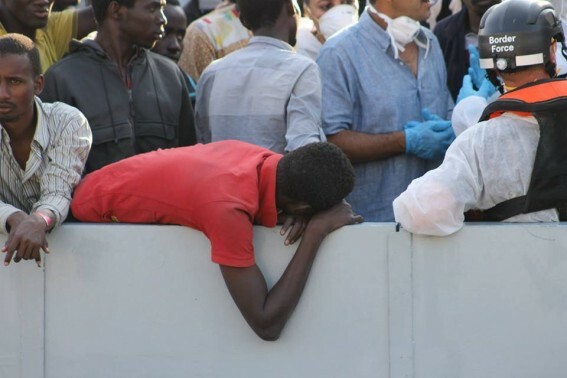 Hundreds of thousands are fleeing brutal conflict and oppression in a number of African and Middle Eastern countries to embark on a dangerous journey to Europe – turning the Mediterranean into a sea of death and despair. Waiting: more than 200 migrants wait for this British rescue ship to dock so they can start their new lives in Italy and beyond. "I'm glad we made it." 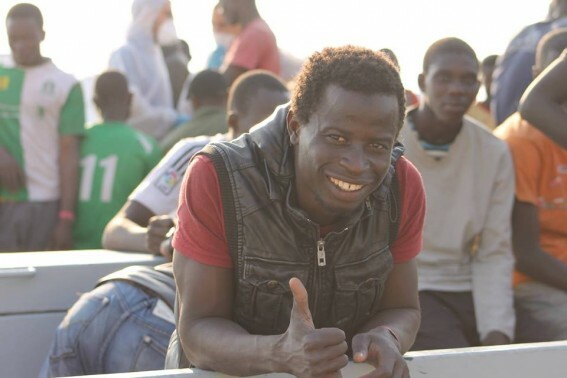 This man fled the Gambia and the harsh dictatorship there. 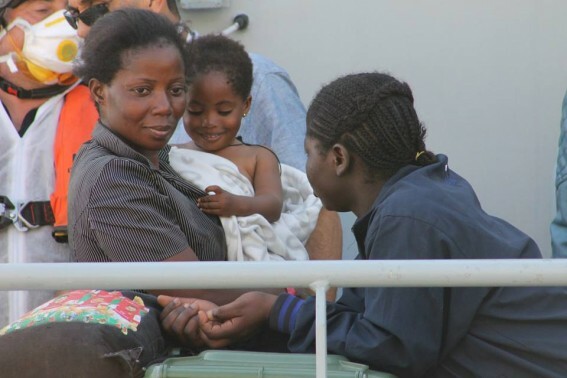 Relief: A pregnant mother and the youngest of the migrants rescued today. Exhaustion: while many are anxious and excited, the perilous journey has clearly taken its toll on others. 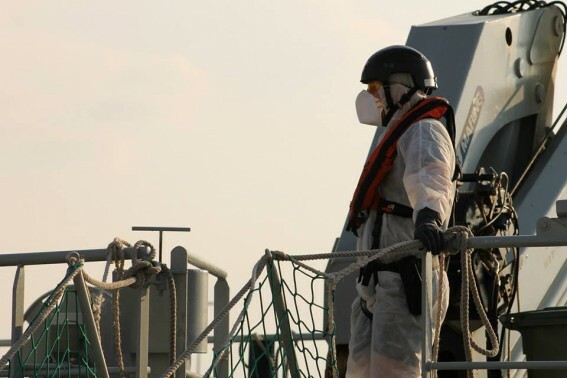 Health Risks: Crew members dress in hazmat suits to avoid contracting/spreading diseases. 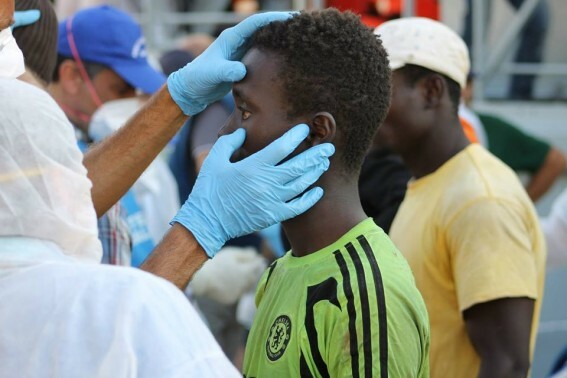 First steps: these young migrants take their first step on land after nearly dying at sea. The inflatable raft they embarked on held more than 100 people, and was found by rescuers just as it began to sink. Three young migrants disembark the "Protector"-- the British ship that became their refuge and savior. 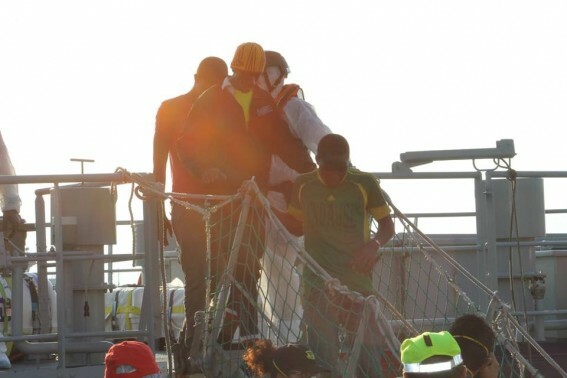 Medical workers examine each person as hop off the ship to ensure they are healthy. Well, this is very sad but at the same time the goverment can’t feed all these people there population is full just like China. this is very rude. The people who are not letting them in I just would like to say, what would you want if it was the other way around and if MLKJ was alive this would not stand. WHAT HAS THE WORLD COME TO??? I think it’s sad that people are ignorant of the full picture of these refugees due to lacking information from our media. 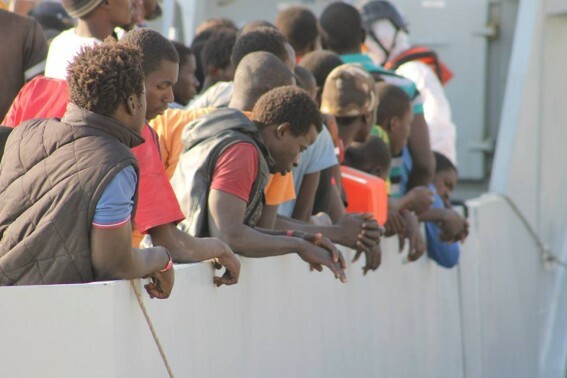 Look above, why are they mostly young men (who make up to 70% of the “refugees” in many cases) instead of women and children? Are these refugees or soldiers? Anyone remember what ISIS said about using ‘refugee crises’ to send their fighters into Europe? Also, why are the richest Mideast nations not taking in these refugees? Even though be a far safer and much shorter trip for the refugees. Then there’s reports from groups in Germany, like Landesfrauenrat Hessen, Der Paritätische Hessen, Pro Familia Hessen and Landesarbeitsgemeinschaft Hessischer Frauenbüros They’ve released documents showing these groups’ concerns that women and children in and around these refugee areas are being assaulted, attacked by male refugees. Don’t believe everything (the propaganda) you’re seeing from our mass media. Question and do you’re own research.